Organizations are made up of people, and TAA was a multiracial, multilingual, multicultural organization from the very beginning, as it employed returned service men and women for their technical or professional skills, emigrants who had chosen to start a new life in a new country, women whose wartime expertise would benefit a new and growing organization - TAA did not discriminate,- Greeks, Italians, Turks, Germans, Brits, Paddies, POMS, all were accepted, but its strongest influence was camaraderie, and the desire to make this airline Australia's best. Each department had a hierarchy, and as such it conformed to the management pattern of that time. A title given to the people who actually flew and controlled the aircraft, with other associated departments who provided passenger service, organized flight schedules, and planned all aircraft operations. It also included a liaison with a specialist area - Technical Services - which, although independent and a separate highly technical area, - provided the research and verification necessary when selecting aircraft equipment to operate, and for replacement as technological change affected the overall running of the airline. Pilot recruitment was a vital part of the establishment of the airline, not that experience was not a vital component, but RAF, RAAF pilots did not have to worry about who was 'seated down the back', but the reputation of the airline was based on 'safety being most important'. Pilots were recruited from the military forces and also from existing commercial and established airlines, providing a blend and interaction that guaranteed the perfect balance. Employing women to provide in flight service was a new and different challenge and TAA 'poached' a Senior Hostess from ANA. - Helen Sommerville - who had joined ANA prior to WW2, and had a lot of experience. Both Butler and Holyman Airlines had employed 'Hostesses' from 1937, and it was a highly sought after job in those early years. Many young men had found the importance of supporting their comrades during the war years and developed both the skills and understanding of keeping the aircraft flying. These skills were to be again tested when employed in the public area after the war. TAA had many young men who wanted to continue their trade when the war ended and TAA took full advantage of their experience. Throughout the years when TAA sold an aircraft it always commanded a higher than marketplace price because of the manner in which TAA had maintained the aircraft. 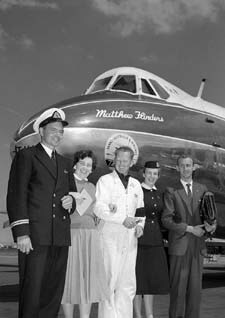 In establishing a new airline, the government had the pick of the best in the industry and TAA reaped the benefit of the experience of QANTAS, the RAAF, Commonwealth Treasury, Commonwealth Aircraft Corporation, A.N.A, Butler, Holyman, Ansett and Guinea Airways, and many from the public sector commercial fields from legal, finance and hospitality, to be headed by a family member of a retail giant in Australia's private sector, Arthur Coles, (later Sir Arthur) from the G.J. Coles retail stores, with branches throughout the Eastern States. - recruited according to 'attitude', 'personality', and 'willingness to achieve', this was a colorful group, from Clerks to Cooks, Pen pushers to Public Relations Officers, Reservations Sales clerks to Salesman and Supply Sergeants, all came together to form a new and developing workforce for a venture that may fail at the next election, for with a change of government would be a change in structure - TAA would be sold to private enterprize, as the Opposition party had vehemently opposed the introduction of a government owned airline. As part of the agreement to start the airline, Arthur Coles insisted on and got agreement that he would have no government interference with the running of the airline, and from day one - one month before the programmed commencement, Arthur Coles took a brave gamble, and put every section to work for the first departure and even on day one TAA started to show its metal, serving a hot meal in flight for the first time on any domestic airline - scrambled eggs on toast for breakfast, and the aircraft departed 'on time', and arrived 'on time', a good omen for what was to be the greatest expansion of aviation services in Australian aviation history. The gamble paid off as all staff revelled in the fact that in reality they had launched and operated the airline within a period of 3 months, and Arthur Coles had only been employed for 8 months, and he was the first employee.